In the same way that Christmas can be all about toys and Easter can be all about chocolate eggs, Shrove Tuesday is another Christian tradition that has ended up becoming known for something other than its original purpose - delicious pancakes. 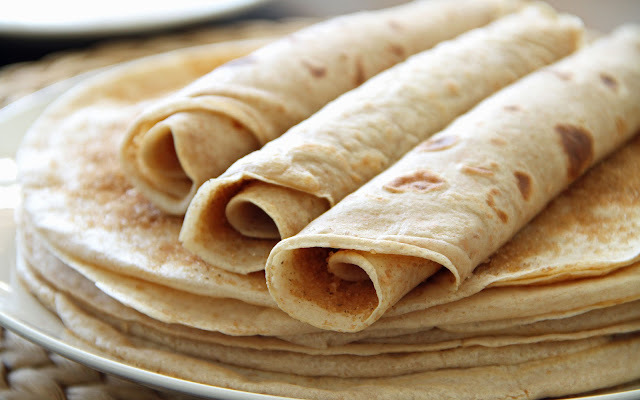 Shrove Tuesday is the day before the beginning of Lent in the Christian calendar, and has been documented as far back as the year 1000 AD, when the English abbot Ælfric of Eynsham wrote of people going to their confessor to receive "shrivance" (forgiveness) for their sins in the week before Lent. Even then it was common for people to give something up for Lent, and it's believed that people used up their stores of foods like butter, eggs and fat in the days before it. It isn't until the 16th century that we have definite records of people using those ingredients to make pancakes on on Shrove Tuesday. In some areas, the tradition of eating fatty foods gave Shrove Tuesday a new name - "Fat Tuesday", or "Mardi Gras" in French. Other traditions sprang up over time. In Britain, pancake races are common - people in fancy dress race down a street while flipping pancakes in pans. This tradition is believed to date from 1445, when a woman from the town of Olney in Buckinghamshire heard the church shriving bell calling people to confession and ran to the church in her apron, still flipping the pancake she had been cooking. In Latin America, Mardi Gras became a festival of colour, costumes and parades, and has pretty much taken on a life of its own. The idea behind it is still the same though - a day of festivities right before Lent begins. Irish traditions are a bit less flashy - it was seen as a time for families to get together and tell stories. Some local traditions included having the eldest unmarried daughter flip the pancakes to determine whether or not she would have good luck this year (dropping the pancake was bad news) and enjoying a large amount of meat alongside the pancakes. In some cases, a small piece of meat was pinned to the inside of the chimney and left there until Easter Sunday to bring good fortune to the household. So, as you tuck in to your pancakes today, consider how much history there is behind them. And if you hear the shriving bell, put your pan down before you run outside.